Down at the bottom of the sea, you can find these feline fishies. They live and they play underneath the foam spray. They slip and slide and ride with the tide. They chase little fishies around the seaweeds. If you are lucky some day visiting the bay, during the full moons low tide. You might sneak a peek at a mercat asleep, sunbathing on the beach! 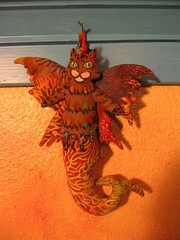 This large mercat is a sporting 10″ with a 9″ wing span. What a ketch! The sea cat has a ribbon on his back so you can hang up in your favorite nautical themed room. Embelished with tiny little beads and shells. Enjoy your new adopted “Celestial Cat”. He is totally flea less . He won’t scratch, bite, or leave smelly prizes in the litter box, or potted plant. He’s fixed so he can’t spray the curtains or furniture. You can hug him and squeeze him all you want he wont cry or beg you for food. This tiny black slyvester kitty is only 2 1/2″ tall, pick of the litter. 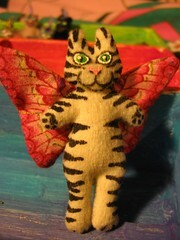 I have made 100’s of cat dolls this one looks like a cat my brother had in high school named Snooka. What a cat, he had the biggest eyes and had short stout legs. He would do pull ups on the door frames. My brother would catch him on his shoulder. Geoffrey named him after that wrestler Jimmy Superfly Snooka. He would occasionally hunt mice in the house. Madame Mao has an appetite for blue bellies and aligator lizards. Miss Mao is my roomate Megans Cat. Sometimes I get the lizards away from her before they get this far. I have a new pet aligator lizard called stubby. Mao brought her to me missing a tail. Stubby is doing fine now her tail is growing back quite nicely. Most of the cats I know are house cats, Mao likes to stroll all around the property she finds fun things for cats to do. This is Circle Cat. 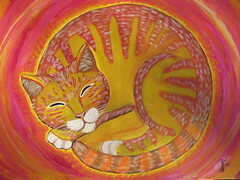 My girlfriend Sally paints circle cats. Some times we get together and paint them outside. This one is dedicated to Heather a 13 year old ginger owned by Gwen. Heather is a cuddle bug she purrs loudly and when you are sitting or lying on the couch she hopps up on your belly and pokes around with her feet circling around till she finds just the right spot then she plunks down for a more comfortable position for you. 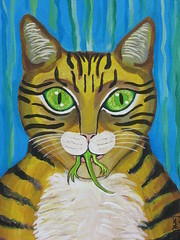 The 3rd cat painting in acrylic paints of my Cali Cats series. My friend has this majestic loveable cat OOch. I immortalized him in oils, By painting his image. Cats are my favorite animals. I have loved many of them. Most of my paintings are of other peoples cats. Right now I don’t have any cats. I have befriended my families cats. 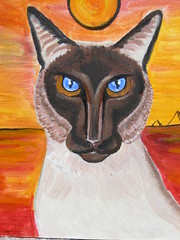 Some of my paintings are tributes to these beautiful cats. I love working in oil paints they are like painting with butter. Oil paints blend so nicely you can make so many colors. Mercat scene . 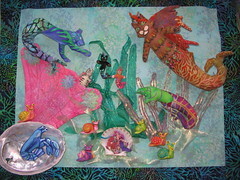 I make mercats out of fabric fun whimsical creatures full of color and cute enough to make you chuckle.